Download Me Before You in Digital HD from the iTunes store. 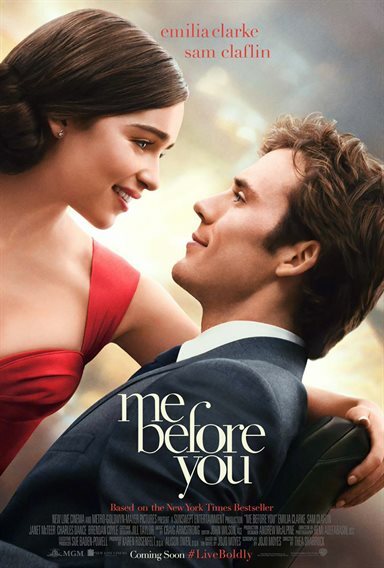 Me Before You images are © Warner Bros.. All Rights Reserved. There is always room for a good love story in film today, and many studios bank on romantic comedies to get female audiences in the seats. What's not to like about a good looking, emotionally damaged leading man, a pretty young lady who "heals" him and a few laughs thrown in? Me Before You isn't that kind of romantic movie. Based on the novel by JoJo Moyes, the film intertwines romance (albeit a little bit forced) with despair and heartbreak. William Traynor (Sam Claflin; Snow White and the Huntsman) had it all. He was young, good looking, rich, successful and had a beautiful girlfriend. Then, one day, he had a horrible accident and became wheelchair bound. Lou Clark (Emilia Clarke; Game of Thrones) is a twenty something free spirit with low self esteem who desperately needs a job. When she answers an ad to be a companion for Traynor, she finds more than she bargained for, including love and heartache. Sappy, clichéd, cheesy, and forced are all adjectives that come to mind when describing this film, and yet, on some level it works. The blossoming romance between Lou and Will is organic, yet almost too quick in developing (although the time line is supposed to be over a period of 6 months). The mere fact that Lou falls for Will is, on the one hand, possible as one of his primary caregivers and, on the other hand, unlikely as most people are not that selfless and don't necessarily relish the burden of a partner with vast medical issues. A harsh sentiment, indeed, but a truth none less. The best part of this film is how beautifully it is cast. Clark is magnetic and infectious as the always-chipper Lou and Claflin does a remarkable job of playing a paralyzed man though he is actually an able bodied individual. Their chemistry is palpable which makes this unique love story more credible. The supporting cast simply enhances these two actors, including Matthew Lewis (Harry Potter and the Deathly Hallows: Part 2), Post Harry Potter as Lou's selfish and somewhat obnoxious boyfriend. Jenna Coleman (Doctor Who) as Treena, Lou's older, single mother sister is a breathe of fresh air as the reasonable down to earth sister to Lou's outrageous one and Charles Dance (Game of Thrones) and Janet McTeer (Maleficent) are excellent as Will's parents, though the latter reminded me often of Helen Mirren. The end is where the heartbreak comes in, as Lou thinks she is changing Will's mind about his decision, but ultimately doesn't. There is sadness and heartache at potential love and life lost, while, at the same time being life affirming, as Lou learns to be more adventurous and "live up to her potential". With a stunning backdrop of rural England, the visuals enhance the overall feel of the film. Sadly, Director Thea Sharrock's (Call the Midwife) lack of experience with feature films makes for a choppy final product with a somewhat unclear time frame. With an underlying life affirming message surrounded by dark and dreary circumstances, one tends to love and hate Me Before You all at the same time. There is a reason Warner Bros. distributed tissues during the preview screening, so if you are in need of a good cry, I highly recommend this film. While not as brilliant as tragic love stories of the 50's, 60's and 70's, it is a step above the usual Nicholas Sparks inspired movies of late. They gave us free tissues for the screening bi think I'm in trouble!